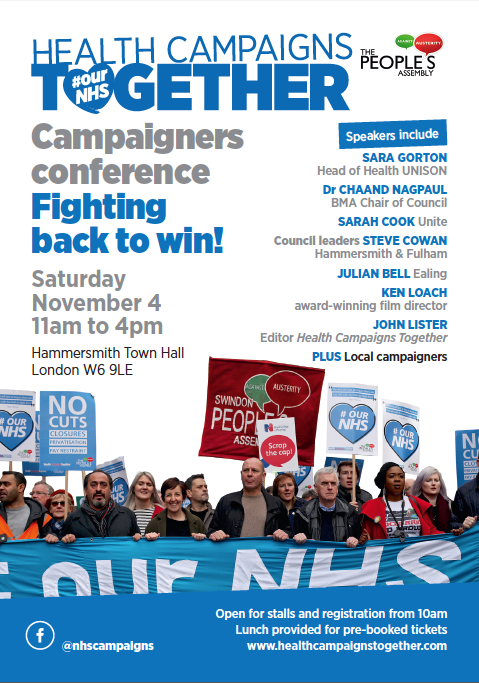 Tickets are still available for the campaigners conference this Saturday at Hammersmith Town Hall. Fighting Back to Win! is organised by Health Campaigns Together and The People's Assembly. 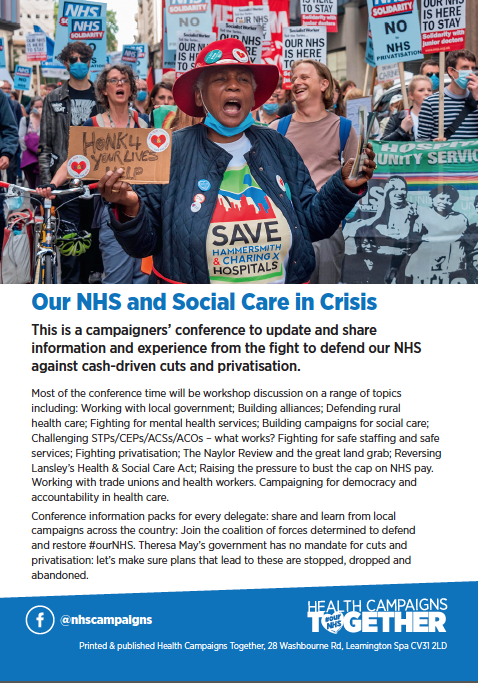 Share and learn from local campaigns and trade union activists across the country and join the coalition of forces determined to defend and restore #ourNHS. There was outcry amongst campaigners, press and politicians following the disclosure of Southend University Hospital Trust's plans to trial an 'AirBnB' style plan of sending discharged patients to private spare rooms. KONP Co-Chair, Tony O Sullivan gave an interview to BBC radio Essex on the 26th October, please scroll through to 1.08.08 to hear what he had to say on the topic. Save Southend NHS circulated a press release that was crucial in getting the story out. Well done Save Southend NHS. The subsequent article by HSJ provided a springboard for the story to be picked up by the mainstream media so widely. Our thanks, too, to Keep Our NHS Public Southend for your work circulating the proposal amongst colleagues and friends. The outcome from the widespread coverage of the plans mean that the trust have been forced to halt their plans - at least for the time being. In addition to his radio interview Tony O'Sullivan wrote this post for the KONP website. The cartooonist Ben Jennings at the Guardian has this to say. The NHS has started to implement new Government rules; charging migrants and visitors upfront to access NHS services. We wrote a post for the KONP website where we outlined KONP's position on the new rules and collated links to articles around the web. 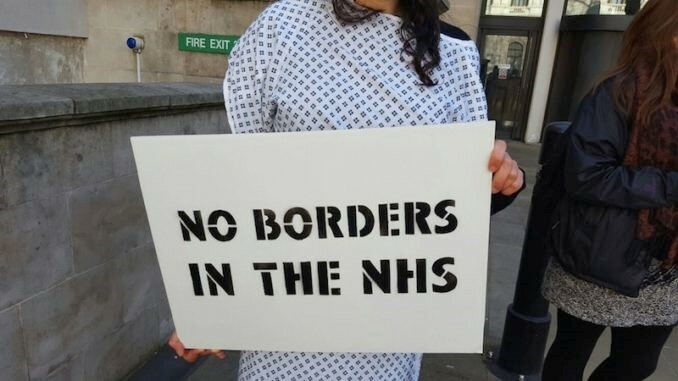 Docs Not Cops are doing great campaigning work in this particular area, initiating #patientsnotpassports and campaigning alongside other organisations for better migrant rights. Their website is a good place to read up on the new Immigration Act and how it restricts migrants' access to healthcare. 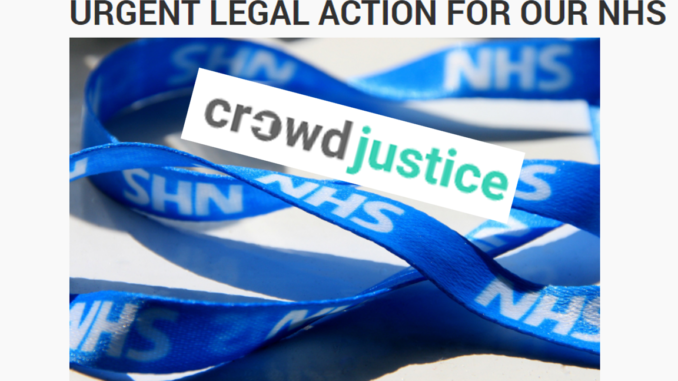 Docs Not Cops were kind enough to write a wonderful guest post for the KONP website entitled "Protect access to NHS on basis of need" in the wake of these changes. The main reason that this is bad news for the NHS is not just that the cost of setting up the charging scheme is roughly the same as the annual cost of health tourism to the NHS: It is that doctors, nurses and frontline healthcare professionals will have to double as border agents. We have written a full report of the changes in the East & North Hertfordshire CCG service provision here. 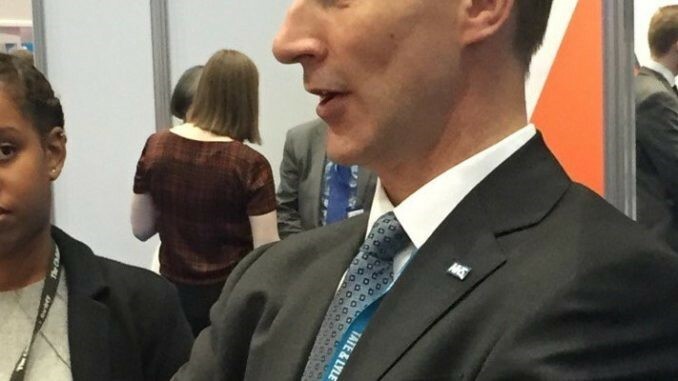 Authors of the NHS reinstatement bill, Peter Roderick and Allyson Pollock alongside Dr Colin Hutchinson, Professor Sue Richards and Dr Graham Winyard have written to the Secretary of State for Health, Jeremy Hunt. They have given him notice of their intention to seek a judicial review to stop NHS England from introducing new commercial, non-NHS bodies to run health and social services without proper public consultation and without full Parliamentary scrutiny. These non-NHS bodies, known as Accountable Care Organisations (ACOs), originate in the US. ACOs will fundamentally change the NHS and involve a radical reorganisation of health and social services in England. They will have control over the allocation of NHS and taxpayers’ money. Their accountability for spending it and their obligations to the public will be under commercial contracts, not statutes. Help them raise enough money to fight ACOs and Hunt here. For more detail see our post on the KONP website. 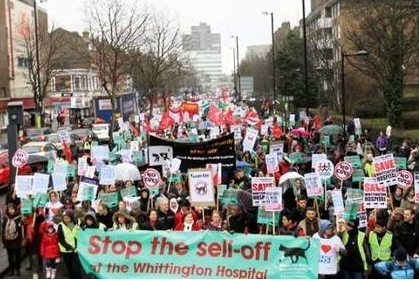 Defend Whittington Hospital Coalition - Keep Rydon out of our Hospital! The Board of Whittington Hospital has voted to employ Ryhurst, a subsidiary of Rydon, to mastermind their forthcoming Estate Strategy. Rydon was the company that refurbished Grenfell Tower. There has been no community consulatation regarding this decision and Defend Whittington Hospital Coalition have created this petition urging the Whittington Health NHS Trust Board to terminate their contract with Ryhurst. They are currently under 200 signatures shy of their 800 signature target. The course is free but you need to book a place. The NHS matters to every single person and every single trade unionist in this couSince 1948, when a Labour Government and people power created it out of sheer vision, blood, sweat and tears, it has been the best in the world. But even before the advent of the 2010 Coalition and the current Tory Government there were already moves to underfund and privatise Our NHS. Alarm bells began ringing! What are the pressures? Do we still believe in ‘NHS Values’? Can the NHS survive?The fight to save our publically funded, publically provided NHS is the one that has galvanised the most people in recent times. This will be a special Socialist Sunday day school packed with valuable information, tears and laughter, and - we have a plan! A plan to save our NHS from the profiteers! Join Derbyshire Save Our NHS on for a Rally to Save Our NHS in their Colourful Motorcade. They will be travelling from Nottingham, Burton, Chesterfield, Belper, Derby to Matlock, arriving at Matlock County Hall Car Park at 11.30. Hoping for a Glare of Publicity as they drive in their Vehicles of Protest. The meeting in the hall will take place between 12.00 and 13.30 and will look at what's happening to Our NHS. What can be done to be a campaign AND WIN? Get in touch with Derby/Derbyshire Save Our NHS by email. More to come soon at here.